Let’s connect tables, equations, graphs, and stories of functions. 7.1: Which are the Same? Which are Different? Here are three different ways of representing functions. How are they alike? How are they different? The graph shows the temperature between noon and midnight in City A on a certain day. The table shows the temperature, $T$, in degrees Fahrenheit, for $h$ hours after noon, in City B. Which city was warmer at 4:00 p.m.? Which city had a bigger change in temperature between 1:00 p.m. and 5:00 p.m.? How much greater was the highest recorded temperature in City B than the highest recorded temperature in City A during this time? Compare the outputs of the functions when the input is 3. The volume, $V$, of a cube with side length $s$ is given by the equation $V = s^3$. 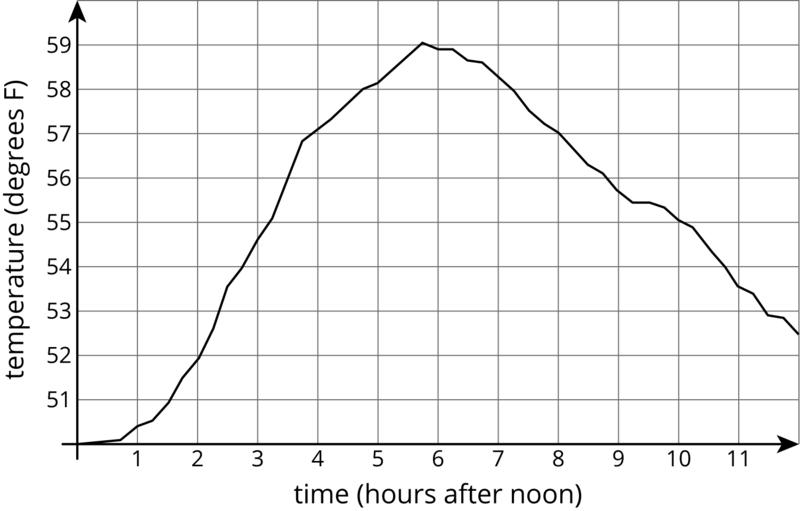 The graph of the volume of a sphere as a function of its radius is shown. Is the volume of a cube with side length $s=3$ greater or less than a sphere with radius 3? Estimate the radius of a sphere that has the same volume as a cube with side length 5. Compare the outputs of the two volume functions when the inputs are 2. Here is an applet to use if you choose. Note: If you want to graph an equation with this applet, it expects you to enter $y$ as a function of $x$, so you need to use $y$ instead of $V$ and $x$ instead of $s$. Estimate the edge length of a cube that has the same volume as a sphere with radius 2.5. Elena’s family is driving on the freeway at 55 miles per hour. Andre’s family is driving on the same freeway, but not at a constant speed. The table shows how far Andre's family has traveled, $d$, in miles, every minute for 10 minutes. How many miles per minute is 55 miles per hour? Who had traveled farther after 5 minutes? After 10 minutes? How long did it take Elena’s family to travel as far as Andre’s family had traveled after 8 minutes? For both families, the distance in miles is a function of time in minutes. Compare the outputs of these functions when the input is 3. Functions are all about getting outputs from inputs. For each way of representing a function—equation, graph, table, or verbal description—we can determine the output for a given input. Let's say we have a function represented by the equation $y = 3x +2$ where $y$ is the dependent variable and $x$ is the independent variable. If we wanted to find the output that goes with 2, we can input 2 into the equation for $x$ and finding the corresponding value of $y$. In this case, when $x$ is 2, $y$ is 8 since $3\boldcdot 2 + 2=8$. If we had a graph of this function instead, then the coordinates of points on the graph are the input-output pairs. So we would read the $y$-coordinate of the point on the graph that corresponds to a value of 2 for $x$. Looking at the graph of this function here, we can see the point $(2,8)$ on it, so the output is 8 when the input is 2. 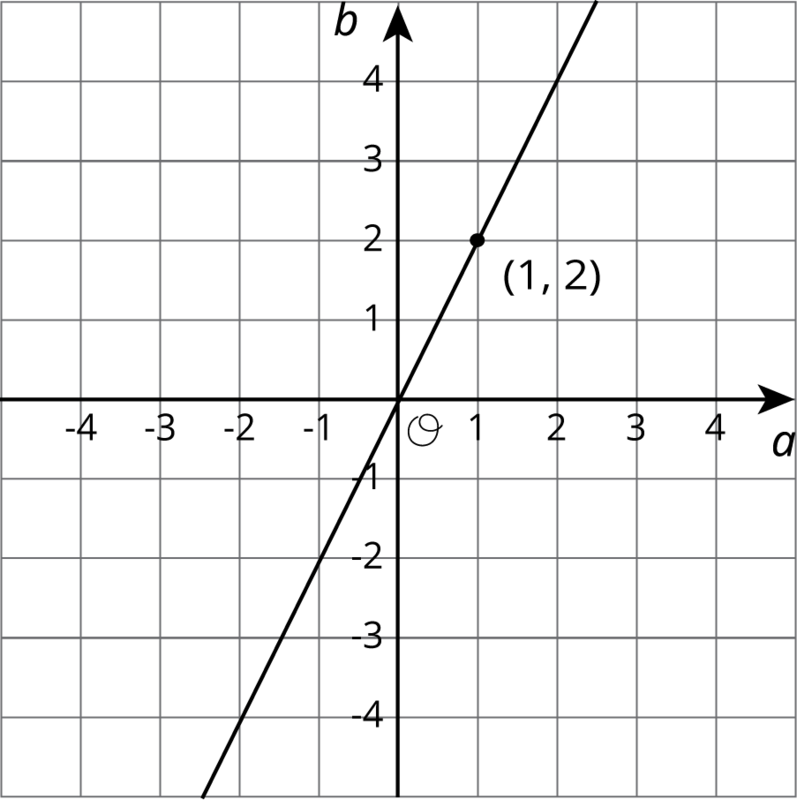 A table representing this function shows the input-output pairs directly (although only for select inputs). 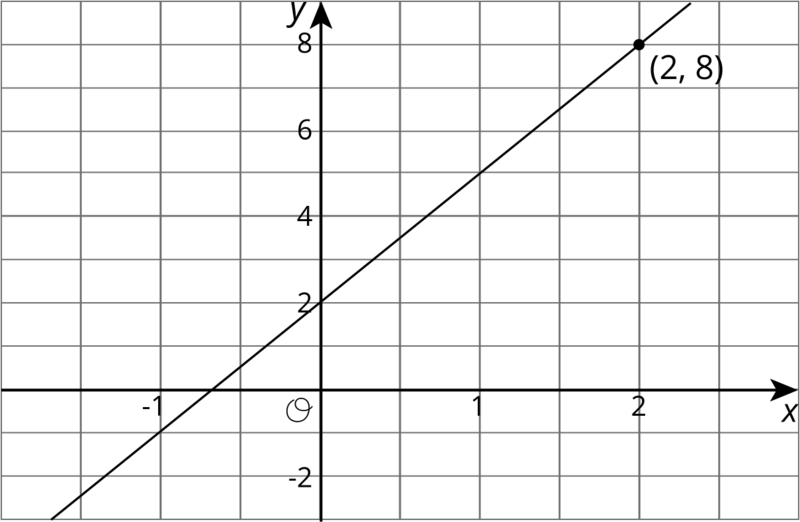 Again, the table shows that if the input is 2, the output is 8.